Luckily, it drips away from this extreme tailgating icon. Game day wouldn’t be complete without a few trick plays so enter, The Smokehouse Barbecue Fatty that’s filled with many of your favorite foods rolled into a snug blanket of smoky goodness. The ultimate bacon cheeseburger of sorts, it’s a concept that has been stealing the hearts of those who man the grill on Saturday for quite sometime & rightly so. It’s an impressive recipe to share with friends & can be prepared with a variety of good contenders. If you’ve ever made a homemade latticed topped pie, you’re ahead of the game. 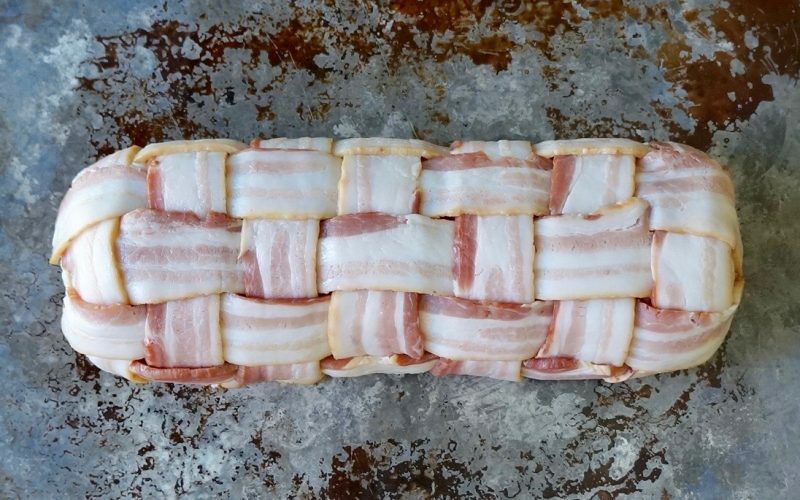 The bacon pattern can be woven quickly. 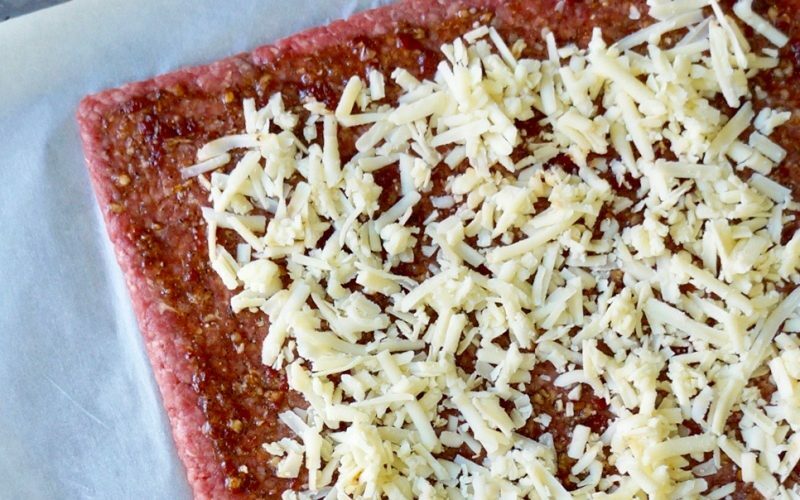 To make a perfectly square piece of ground beef, use a rolling pin to push it into the corners of a zip-top bag. Simply cut the bag away, invert onto parchment paper, top with a few additional ingredients, then roll it up like a holiday Christmas cake. And you don’t even have to be the quarterback to complete a tight spiral. The roulade slices into pretty little pinwheels. Get ready to impress football fanatics with this fun idea by following my comprehensive instructions & photos plus have a peek at the video tutorial from Magic City Weekend courtesy of WBRC Fox 6 Birmingham for the easy win. 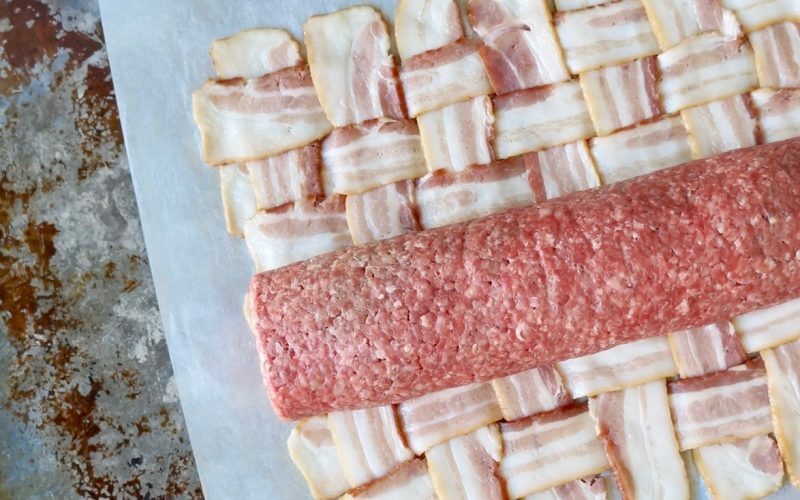 All of the flavors found in a burger with the works are tucked away in this extreme game day recipe rolled in a woven blanket of bacon goodness. Prep the day before & smoke during tailgating festivities. Soak the wood chips in water for 30 minutes. Drain. Place the chips in heavy-duty foil & make a packet. Poke a few holes in the foil. Set aside. 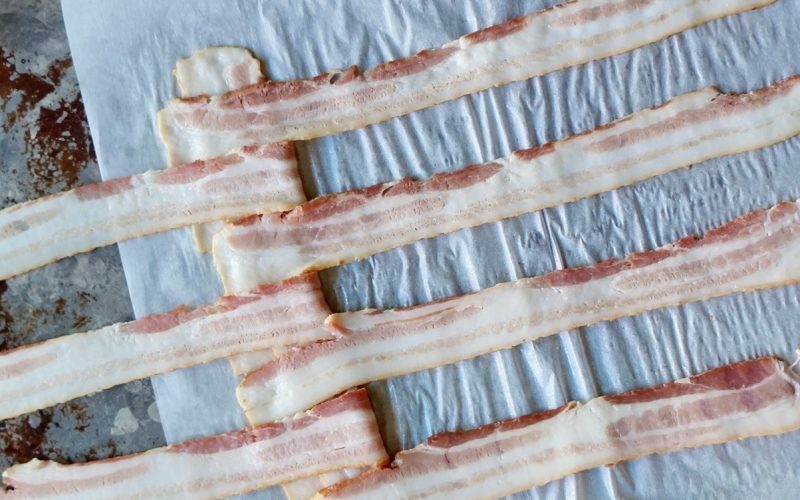 Place 7 strips of bacon over a 15 x 15-inch piece of parchment paper. Peel back pieces 1, 3, 5 & 7. Place a strip of bacon vertically over pieces 2, 4 & 6; cover with pieces 1, 3, 5 & 7. Working in the opposite direction, peel back pieces 2, 4 & 6. Place a strip of bacon vertically over pieces 1, 3, 5 & 7; cover with pieces 2, 4 & 6. 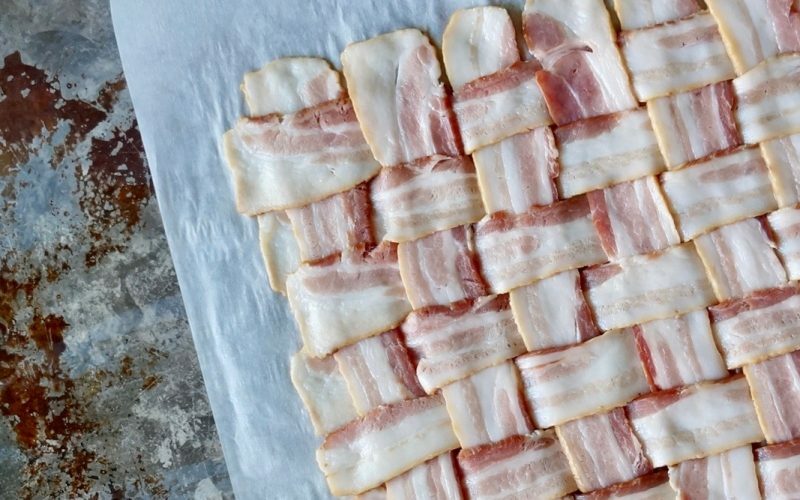 Repeat the process to form a square of bacon lattice. Place the ground beef in a 1-gallon size zip-top plastic bag. Roll into a square using a rolling pin. Push the beef into the corners being certain it’s an even thickness. Cut the bag away using scissors & invert onto a 15 x 15-inch piece of parchment paper. Remove the bag & discard. Combine the brown sugar, the salt, the pepper, the chipotle peppers & the garlic to form a paste. Spread the mixture evenly over the beef using the back of a spoon. Sprinkle the cheese within 1-inch of the edge. 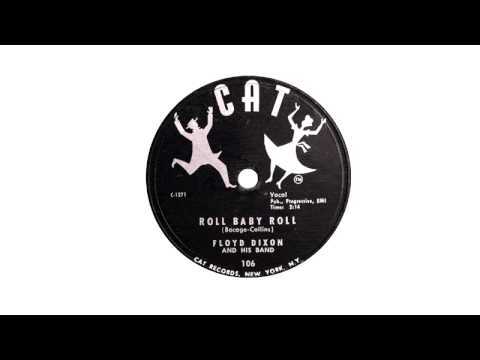 Roll the beef, jellyroll fashion, using the parchment paper as a guide. Pinch the ends to seal. 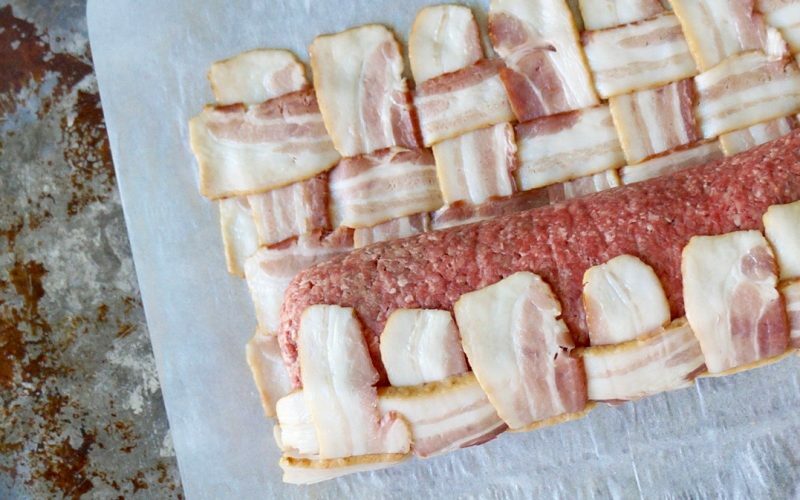 Place the beef roulade in the center of the bacon lattice. 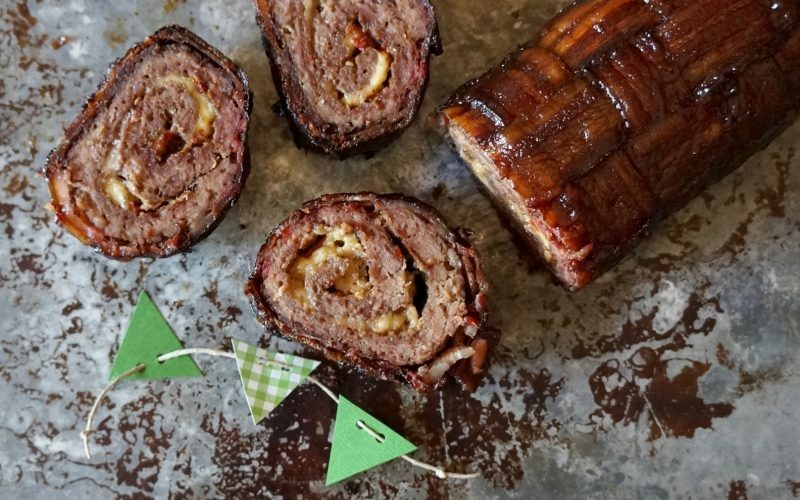 Roll the bacon around the beef roulade using the parchment paper as a guide. Tuck the ends of the bacon over the sealed portions of the beef roulade. Chill 1 hour. Build a fire with charcoal. Add the packet of wood chips to the grill or smoker. Place the bacon wrapped beef directly on the grate seam side down over indirect heat, about 225 to 275 degrees. Cook 2 hours or until an internal temperature registers 160 degrees. Combine the barbecue sauce & the bourbon; brush over the bacon. Cover with the lid & cook an additional 10 minutes. Let stand 15 minutes. Cut into pieces. Serve with additional barbecue sauce, if desired. Cut the roulade into smaller portions to serve the recipe as an appetizer. 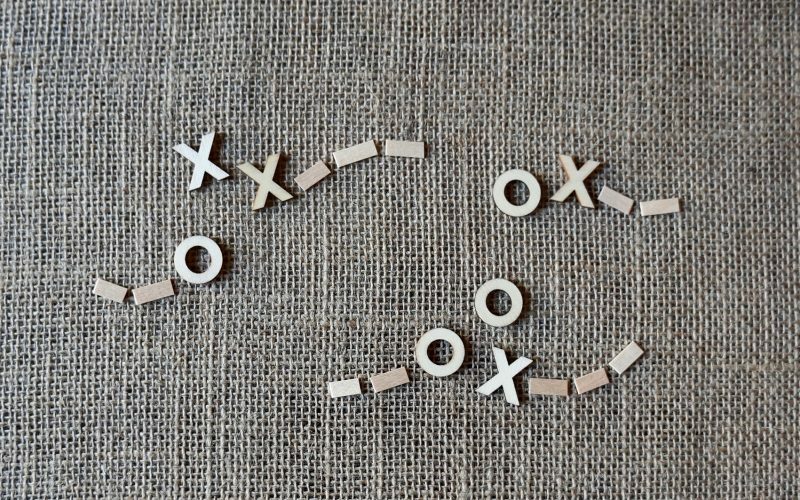 Offer wooden picks to football fanatics & additional barbecue sauce for dipping. A few trick plays make this extreme tailgating recipe a fan-favorite. Sporting all of the right moves, it’s easier to prepare than you may think. Follow my comprehensive guide & impress friends with a team of smoky flavors. 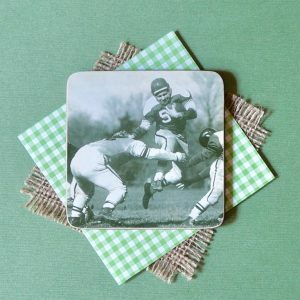 If you’ve ever prepared a lattice topped pie, you already have the skills needed to make the foundation piece of this wild tailgater’s delight. If not, the good news is that it isn’t difficult & I’ve provided detailed instructions on how to pull it off. The key take away is to make sure the finished design doesn’t have any gaps so place the bacon strips close together while building it. For additional tips, look to A Lesson In Lattice. 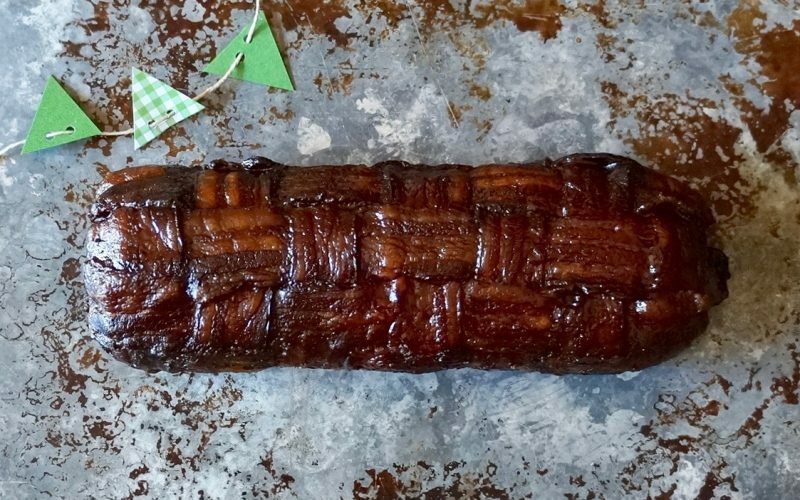 Although the topic refers to pastry, the concept can be applied to bacon as well. 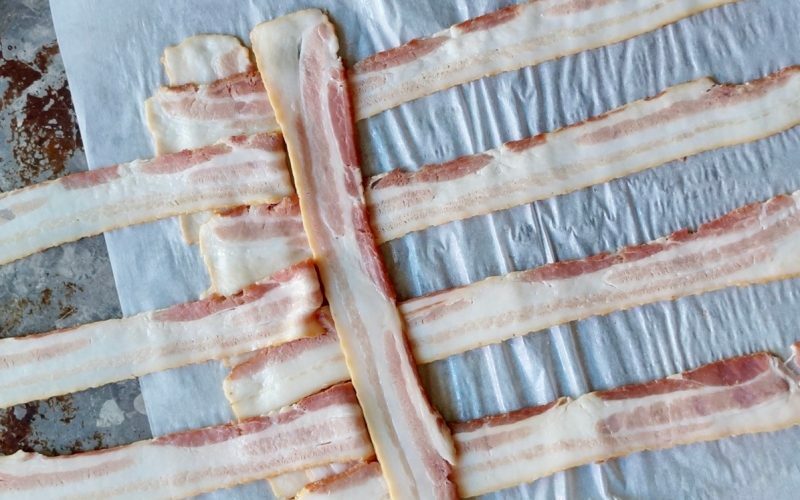 To get the design started, simply place 7 horizontal strips of bacon over the parchment paper. Peel back every other row, top with a strip vertically, then return the peeled back pieces to cover. Once the first row is complete, switch sides & continue the remaining steps working in this direction. Next, peel back rows 2, 4 & 6. Place a second piece of bacon vertically over rows 1, 3, 5 & 7. The bacon should just touch to create a compact design. 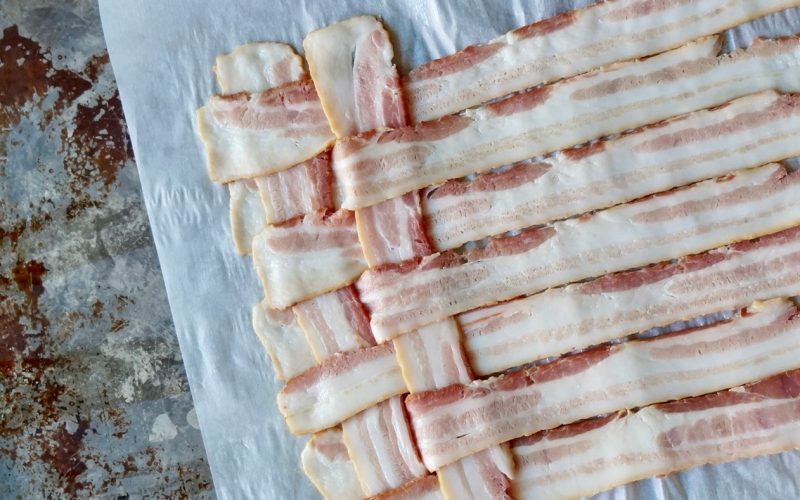 Once the horizontal pieces of bacon have been returned to their original position, you’ll simply repeat the weaving process until a beautiful blanket of smoky goodness has been formed. Set this aside while you prepare the beef roulade. 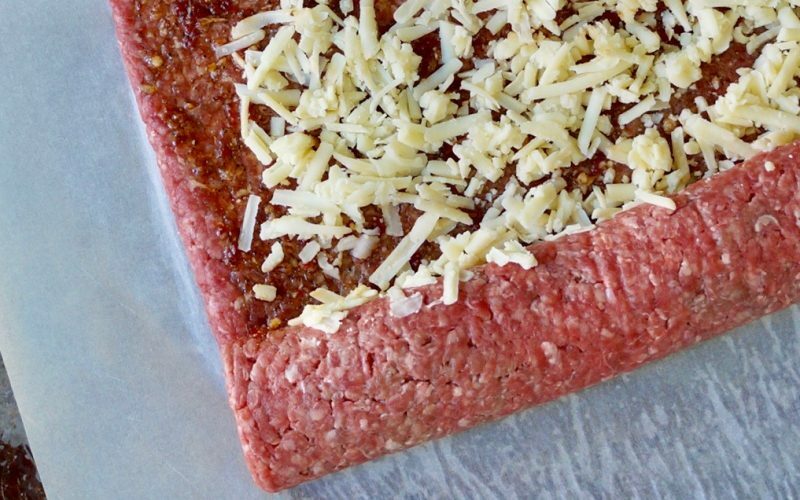 To create the perfect square shape, roll the beef in a gallon size zip-top bag being certain it’s pushed into the corners & that it’s an even thickness. This will ensure a steady cook time & balanced shape. Once the beef has been inverted onto the parchment paper, spread the seasoning mixture evenly over the surface. Use the back of a spoon or a barbecue basting brush & not your fingers as the chipotle peppers are very spicy. Sprinkle the cheese over the seasonings & leave a border for easier sealing. If you’ve ever made a roulade dessert, the technique is the same. Simply begin rolling the beef over the filling ingredients & use the parchment paper to guide the process. A tighter roll will yield a prettier spiral shape once cooked. As you roll the beef, tuck the cheese in as it may push outwards during the process. The roulade is easy to maneuver at this point. Place it in the center of the bacon lattice seam side down. It’s important to seal ends closed to contain the filling. Press some of the beef over the open edges. About a 1/2-inch of bacon will be exposed on either side of the roll. The final roulade should measure approximately 9 1/2-inches or so. Using the parchment paper as a guide, press the bacon over the roulade to begin the final process. Continue rolling until the bacon completely encases the beef roulade. Press the bacon on the edges over the beef to seal further. It should measure approximately 10 1/2-inches. Place The Smokehouse Barbecue Fatty in the refrigerator to chill. This will help firm everything up before adding it to the cooking grate. After a bit you can get the grill or smoker ready. Look to The Tailgaters Quick Reference BBQ Guide for additional tips. The roulade can be held up to 24 hours if you’d like to prep it the day before your tailgate. Once the beef registers 160 degrees, slather it with the bourbon infused barbecue sauce. Cover with the lid & cook an additional 10 minutes. Remove from the smoker & allow The Smokehouse Barbecue Fatty to stand about 15 minutes before slicing into medallions for the tidiest look. Watch the video to see how easy it is to make this in your own kitchen.